Julia Morison is an iconic artist and it’s hard for me not to ‘fan-girl’ over her practice. Whenever I enter the Christchurch City Council and see Myriorama:08 ‘Knot’ (2010) I pause. And memories of her retrospective exhibition, a loop around a loop at the Christchurch Art Gallery in 2006 still gives me art chills. I even follow her dog (and erstwhile collaborator) on instagram. It’s all justified admiration. An Arts Laureate since 2005 and an Officer of the Order of New Zealand Merit since 2017, Morison’s career spans over forty years and she consistently delivers work that defies easy categorization and pulls me in. 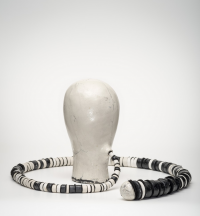 Head[case] brings together a series of new works - 100 ceramic ‘heads’ - made over the past 4 years. Each form is modelled on a traditional wig-maker’s block and seems imbued with its own story, emotion or personality. They are arranged on varying levels in hexagonal ‘rooms’, some meet me at eye level, while others, I have to crouch down or crane my neck to peer at. Some seem to float, trailing spines, lashes, wires or sprouts of hair. I feel as though I’ve stepped into a cabinet of curiosities, a museum or a desiccated bestiary. The sound-scape by John Christoffels is a superb accompaniment to the show. It journeys between hackle raising eerie whines and disquieting peaks to grandiose, luxurious dulcet tones - at times almost romantic but always uncanny. Some heads are endearing while others are comical, sensual, sumptuous or tortured. Knights/monsters and poor, injured noggins converse or sit adjacent to visions from dreams and nightmares - It gives me hazy memories of seeing Return to Oz while too young. There is a head for every occasion. Horse hair and lashes brush the floor and stories seep out of eye slits and crisp lips, sutured together. The range of her treatment of materials is impressive. Ceramic is seemingly made into oozing flesh for some - others have glistening, crackled surfaces, built up textures or dull rust-like patinas. Eyes and mouths masked by rivets stare blindly at a gold-toothed, grinning maw while another glazed earthenware piece looks squiffily in two directions at once. This body of work and its engagement with an entirely new medium is a testament to Morison’s ongoing sense of playfulness and her exploratory making processes. There are methodical collisions in material and concepts; a delight taken in meshing the familiar with the bizarre. Clay lends itself well to the visceral, tactile qualities of her past works and the esoteric knowledge required to work the magic of glaze and kiln aligns well with Morison’s interest in Kabbalistic mysticism. Head [case] stands up to multiple visits; each circumambulation of the space offers a new vantage point, and a fresh conversation between pieces or new narrative. There is a satisfying circling around of materials, themes and relationship between Head[case] and Morison’s past works – it all loops around in on itself in a surreal and poetic logic. Original generation time 0.2541 seconds. Original generation time 1.2283 seconds. Cache Loaded in: 0.0518 seconds.